I meant to post this last night but Eevee had other plans (she decided to sleep on my computer). This is roughly 5 years old, I found it again while digging through my bookcase. And I’m showing it to you all despite it making me cringe inside. I did this for myself originally, but wasn’t happy with it, so it was forgotten, buried, then dug up again. The words are lyrics from Dir en Grey’s “Child Prey” song, a band I was obsessed with when I was younger (go ahead, laugh it up). 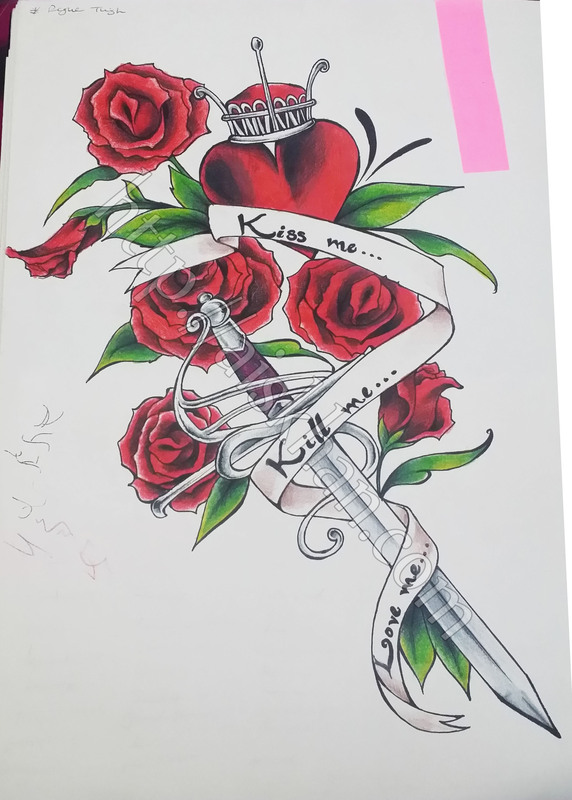 If I were to ever get a thigh piece done (which I would like to) I’d have to start from scratch, I like the positioning, the flowers, but I’d replace the dagger with a bone, most likely a thigh bone. FYI, if you’d like to get this inked onto you, please contact me for permission to use it first.